Fairmont Hotel Vancouver is located in the heart of downtown Vancouver and is the third building to bear the name. The current grand Fairmont Hotel Vancouver stands on West Georgia Street, and opened its doors to the public in May of 1939 after an often-delayed, 11-year construction caused by the Great Depression. This historic hotel has seen many celebrities walk through its halls, including Dal Richards and Juliette, King George IV and Queen Elizabeth the Queen Mother. Until 1975, the hotel was home to the Canadian Broadcasting Company. The building was also used for the exterior shots of the Tipton Hotel for the 2005 Disney Channel favorite, The Suite Life of Zack & Cody. The hotel features 556 charming guestrooms and suites throughout its 17 floors. Guests who stay at the Fairmont Hotel Vancouver will enjoy luxurious accommodations in recently renovated rooms, along with the highest quality amenities. During their visit, guests will discover Notch8 Restaurant & Bar in the lobby, a setting that combines the historic and contemporary aspects of this rejuvenated hotel. Guests looking for relaxation can visit the Absolute Spa, which provides therapeutic spa treatments, as well as salon services for both men and women. The Fairmont Hotel Vancouver has been a registered heritage property since 1939 and has earned a Forbes Travel Guide Four-Star Rating for three consecutive years. In an area as rich as Vancouver, there is never a shortage of exciting activities. Guests can explore the Vancouver Art Gallery just next door to the hotel, or visit the Vancouver Aquarium, Gastown, or Science World. Granville Island, Stanley Park, and numerous water adventures are located within a 60-minute drive of this world-class destination. Exquisite cuisine and fresh seafood abound at nearby restaurants like Blue Water Café and Raw Bar, Le Crocodile, Cin Cin, and Chambar. 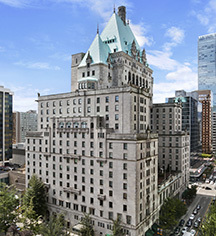 A stay at the Fairmont Hotel Vancouver provides guests with the opportunity to see the heart of Vancouver. 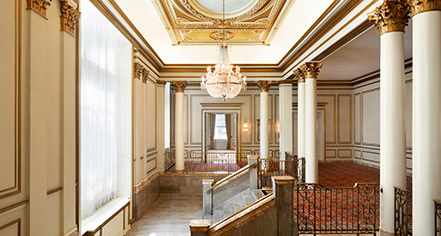 Fairmont Hotel Vancouver, a member of Historic Hotels Worldwide since 2018, dates back to 1939. The Fairmont Hotel Vancouver’s most popular employees are its two lovable Canine Ambassadors, Ella and Elly. Once trainees with BC & Alberta Guide Dogs, their fun personalities found them a career in hospitality. Age Requirements: Guests must be a minimum of 18 years of age to occupy a guest room without adult supervision. Cancellation Policy: Varies based on rate. Deposit: Varies based on rate. Hotel/Resort Fees & Taxes: 16.5%. Occupancy Restrictions: Maximum of four (4) people per room. Parking: Valet parking: $62 inclusive of taxes CAD/night, including in-and-out privileges. Meter parking is now in effect on surrounding streets from 9:00 a.m. to 10:00 p.m.
Pet Policy: $25.00 CAD per pet, per day. Restrictions apply. Learn more about the History of Fairmont Hotel Vancouver .